We open this episode by going backwards to when the little boy and Tae Ik arrive at the dojo. Tae Ik decides he doesn’t want to go in, but when they hear the little boy exclaim his arm is all better the manager decides it would be better to go in and take care of Tae Ik’s shoulder as well, but Tae Ik looks less than enthused about this. 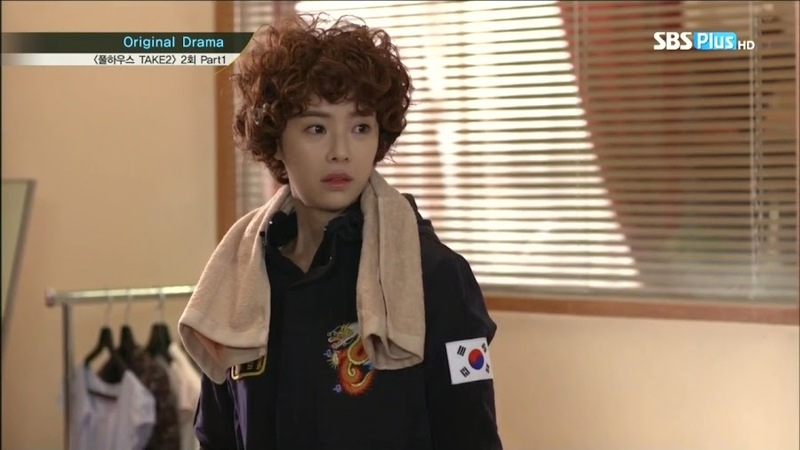 At this time an ahjumma shows up wondering whose van is sitting blocking the stairs to the dojo. She complains that the whole neighborhood should be taken down and redeveloped and tries to squish her way around the van. Looks like she’s there to collect rent for the dojo. We then are taken back inside the dojo where Man Ok says she’s happy to meet Tae Ik again and he’s completely clueless as to who she is. His manager reminds him about the scooter incident. Both looking terrified, they force smiles and say they will just go to the hospital instead. 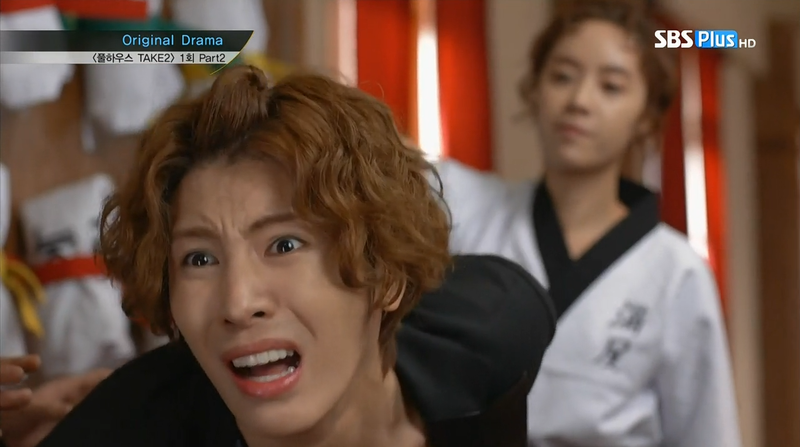 Of course, Man Ok won’t let Tae Ik escape. She quickly grabs his arm and twists it behind his back while the landlady ahjumma snaps a picture of Tae Ik’s new embarrassment. She’s disappointed that she didn’t get a picture of Tae Ik’s handsome face because it was contorted in pain as Man Ok snapped it back into place. 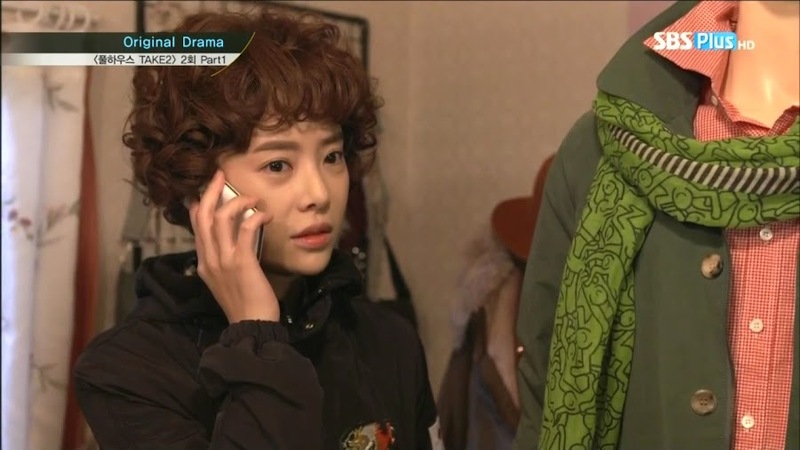 Before she can do anything else, the landlady gets a call from a Mr. Oh and has to leave. Tae Ik has collapsed to his knees and his manager worriedly asks if he’s okay. Man Ok calmly says that Tae Ik is fine—he’s just a crybaby isn’t he? Tae Ik gets up and like a whiny little kid says that he told her it hurts. Man Ok then tells him he should try moving it before complaining, even the little kid didn’t whine that much. The little kid and his dad come over and assure Tae Ik that he should be fine. Try moving his arm, there should be no pain. Tae Ik winces in pain, but they are right—after a little more movement, his arm doesn’t pain him anymore. The kid and his dad leave and Man Ok scoffs at this side of the man who brazenly stole her scooter. Tae Ik then wonders if he should get an x-ray. Man Ok tells him there’s no need as she isn’t a novice at relocating shoulders. All Tae Ik needs is a hot towel. Tae Ik says nothing and goes over to the calendar for the dojo. Man Ok follows him and reminds Tae Ik about poor Billy’s lost arm. She then says that should have dislocated Tae Ik’s other arm instead of helping him. The manager tries to get her to calm down and Tae Ik turns to her and says he knew he was right and she was a member of “Give &” (the boys’ fan club). Tae Ik points to the calendar and says that she knows their schedule better than they do, so why did she lie? Tae Ik says he only asked for her help as she had that emblem plastered on the board on her scooter. Man Ok tells him it’s her friend who’s a diehard fan, not her. Of course, Tae Ik won’t listen. He then takes the marker and draws stars on the calendar. She asks what that is and Tae Ik says it’s her thank you present. As a diehard fan, she should be able to figure out its meaning. He thanks her for fixing his shoulder and leaves. The manager claps her on the back and tells Man Ok she should have told him she was a fan earlier. LOL. 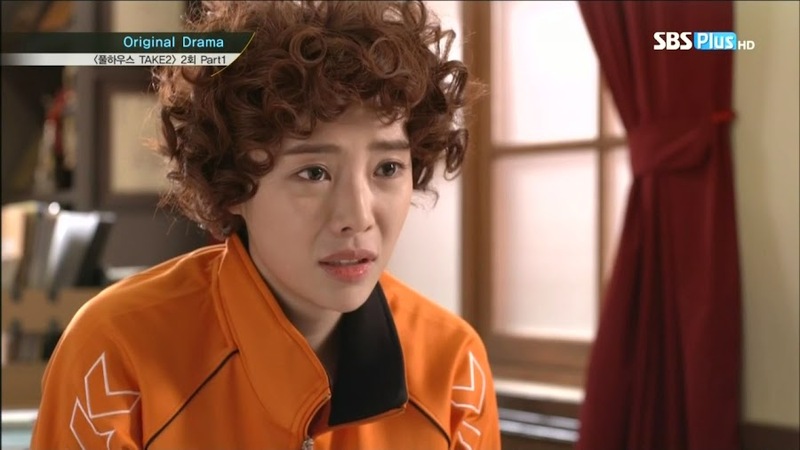 Poor Man Ok misunderstood thanks to Ga Ryung’s fangirl stuff all over the place. He bows and quickly chases after Tae Ik. In the van, the little boy is watching cartoons on a tablet while Tae Ik sneezes up a storm. Is he sick? Tae Ik replies he doesn’t know. The manager then says how surprising it was to meet a female master. No wonder she could flip him so easily at that time. Tae Ik then complains that he thinks Man Ok doesn’t even dust and sneezes some more. The manager then asks him why he left his schedule there when Tae Ik even keeps it a secret from his fans. Those stars translate into a schedule? When Tae Ik remains silent, the manager urges him again. 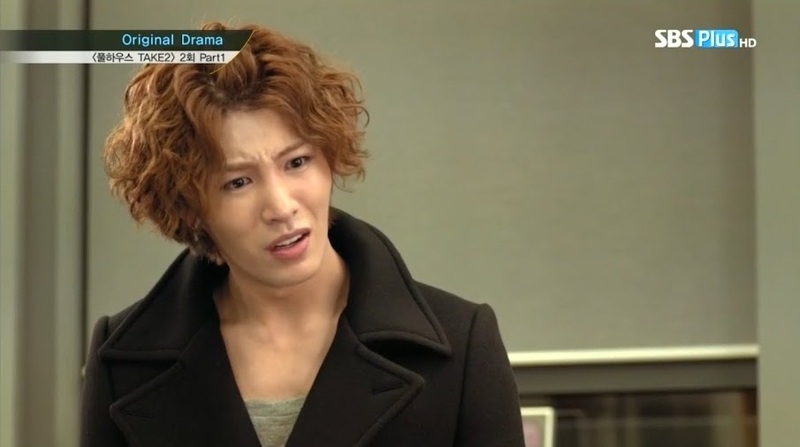 Tae Ik finally angrily says he did so because only Won Kang Hwi’s pathetic schedule was on the board. Tae Ik then counts down all of his own CF schedules and there’s quite a bit. The manager just sighs and shakes his head. Tae Ik angrily demands to know why. This is all Kang Hwi’s fault to begin with. The jerk is probably lying around their house pretending to be recovering. Tae Ik then starts shouting that Kang Hwi is a nuisance, when the little boy takes out his earbud and tells his hyung to be quiet. Well, Kang Hwi isn’t at home lazing around pretending to be recovering. He’s doing his most favorite thing in the world—shopping. He tries on a hat and the sales lady comes up and compliments how attractive he looks in it (I personally think it looks silly since it isn’t really fitting his head, but kind of just laying on top). Of course, once he hears it’s a limited item that is almost sold out, he has to have it. Ah, this boy. 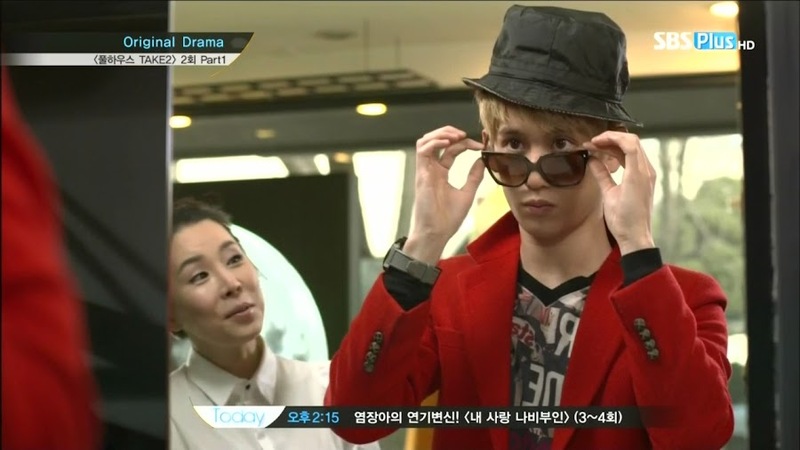 He goes to look at more clothes and there is a gaggle of girls outside with noses pressed to the glass to watch him. They then spot a girl in the back of the store. This woman is infamous for coming to Korea to stalk Take One. The poor fangirls outside are jealous of the rich woman who can go to all of their overseas concerts. One fan asks Ga Ryung about an upcoming fan meet. She’s going right? Ga Ryung morosely says she can’t keep racking her credit card debt up any higher, so even though she wants to be there body and soul, she can’t. 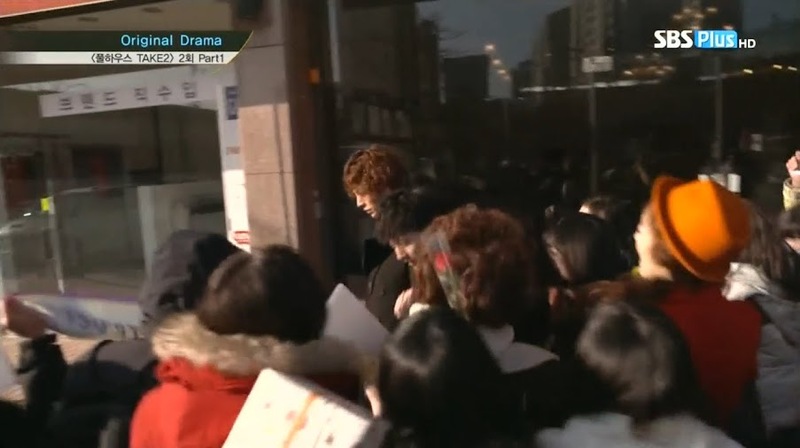 Kang Hwi then waves to the girls outside and smiles. Ga Ryung faints at this and then decides she’ll sell her soul to go to the fan meet now. Gar Ryung runs into the dojo where Man Ok is cleaning and demands money from her. Man Ok smiles and asks if Take One is releasing a new song. Or is it a showcase or a concert? The last bit is said rather angrily. Looks like Man Ok isn’t happy with her best friend’s money draining obsession. Ga Ryun then says that it’s a fan meeting. 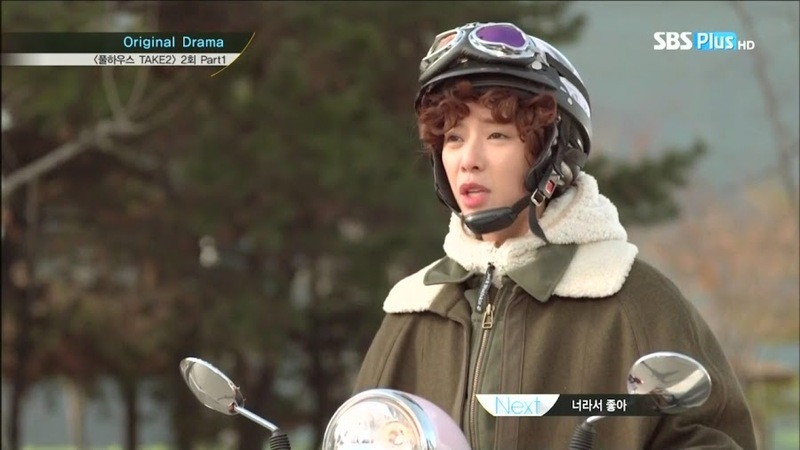 Ga Ryung has to go as her oppa is waiting for her. If Man Ok doesn’t want to give her money for nothing, just think of it as an advance in pay for Ga Ryun helping with Man Ok’s Closet. Besides, didn’t Man Ok make a lot of money from all the sales recently? Man Ok replies that money needs to be reinvested to make more money—besides she just spent it all on pre-ordering their fall collection. Man Ok then points to Billy and says hiring him wasn’t cheap either. 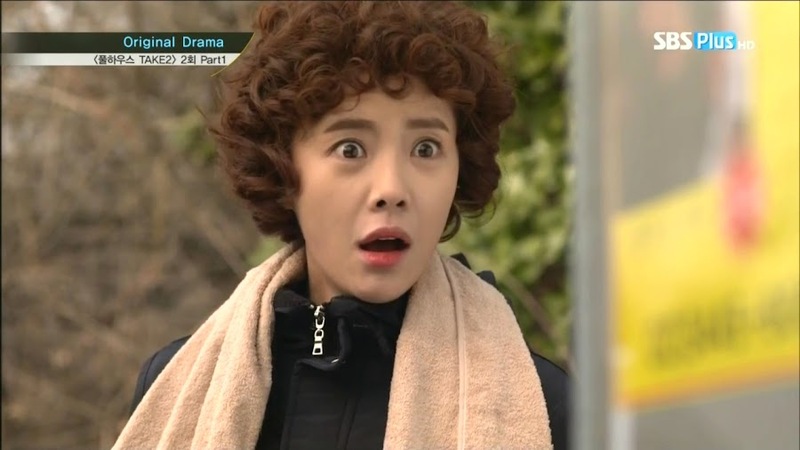 Ga Ryung then asks for money from the students. Man Ok points out that most of the students have already quit there and moved to the new gym at the intersection so there aren’t all that many left. Ga Ryung won’t let it go. She complains that Man Ok is making her feel ashamed. Sure, Ga Ryung is unemployed—but is this as far as their friendship goes? That’s low. Man Ok is being a good friend by NOT giving money she herself doesn’t have and trying to reign in her friend’s obsession a bit. Unfortunately Man Ok is weak against her friends tears. She breaks down and hands over the money Ga Ryung requested and tells her that she must work doubly hard for the online shopping mall as well as taking care of the homepage. Ga Ryung says she will work really hard and begins counting the money. What the heck. There isn’t enough. Man Ok says her friend held up two fingers. Isn’t that $20? Gar Ryung says its VIP seating only so it’s $200. Man Ok is flummoxed. The idols are on TV all the time, so does her friend really need to pay $200 to go see them? Ga Ryung says that if she doesn’t see Kang Hwi often, she can’t sleep at night. Doesn’t Man Ok know how Ga Ryung’s oppa shines. Man Ok says she knows and then fantasizes about when they met. 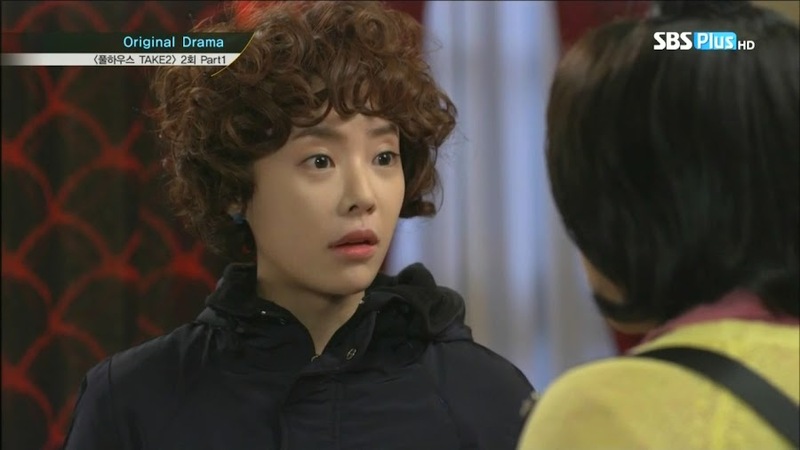 Ga Ryung breaks into her daydream by asking if Man Ok ever met Kang Hwi. Ga Ryung demand to know where, when, and how. Man Ok is about to tell her when she has a fantasy that Ga Ryung will tattle the news about her grabbing Kang Hwi’s hand (to run off to safety) and that will send a gaggle of girls to come and beat her up. Man Ok quickly tells her it was Tae Ik. Apparently Ga Ryung doesn’t like the almighty Tae Ik (she doesn’t even put ‘oppa’ at the end of his name like she does for her precious Kang Hwi). Man Ok says she doesn’t understand. If Ga Ryung like Take One, why doesn’t she like both boys? Ga Ryung replies Man Ok will never understand the complicated heart of fans. She then asks again for the money, but the $20 was all Man Ok could spare. 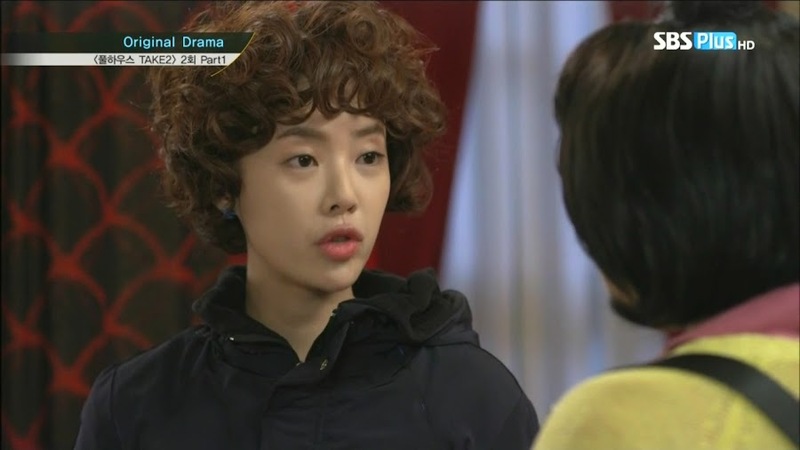 Ga Ryung promises a rent discount as long as Man Ok gives her the money. 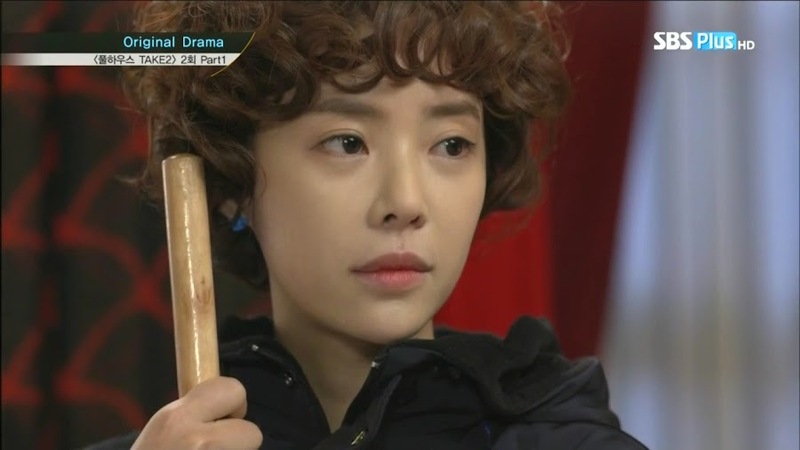 Man Ok threatens to tell Ga Ryung’s landlady mother and sweeps her out with the mop. Ga Ryung goes home and finds Mrs. Hong dancing. 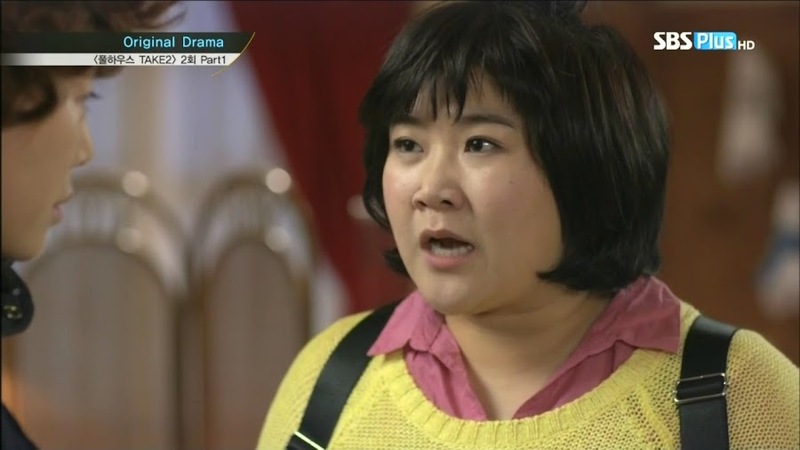 Her mom is ignoring her, so Ga Ryung turns off the music and starts yelling at Mrs. Hong who replies she isn’t deaf. She does, however continue to dance until she does a move that kind of hurts her. Hong tells her daughter that move helps lose belly fat—Ga Ryung should try it before hobbling off. Ga Ryung clasps her stomach and watches her mom leave. I’m guessing Ga Ryung was going to try getting her mother to give her the rest of the money for the fan meeting. 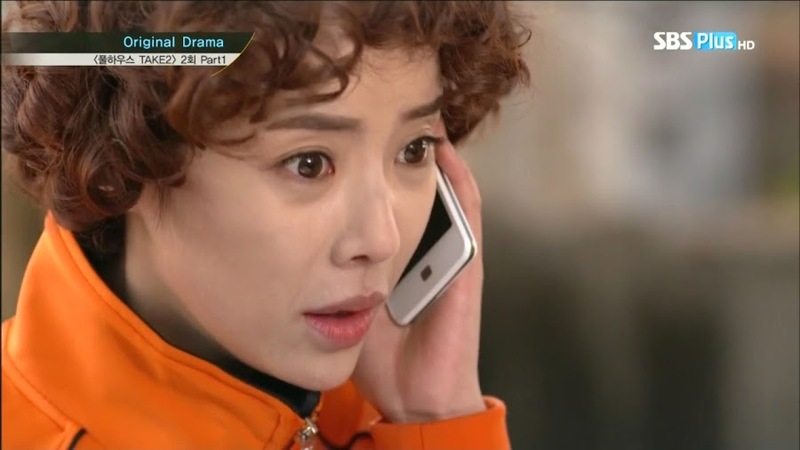 When her mother’s phone rings, Ga Ryung picks it up and ignores the call. She then happens up the picture Mrs. Hong took of when Man Ok was fixing Tae Ik’s arm. This can’t be good. Man Ok is dressing Billy up when she gets a call from Ga Ryung (whose number is stored as “the enemy of my life” lol). 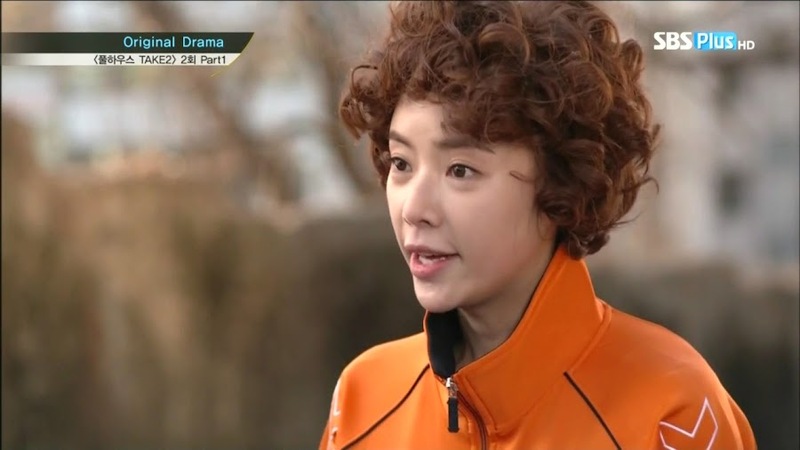 Man Ok answers and Ga Ryung asks if she recruits new students for Man Ok, then will Man Ok give her the rest of the money. Man Ok says she wishes to give Ga Ryung what she wants, but no one wants to take classes anymore. Ga Ryung then says Man Ok has to give her $5/head. Man Ok tells her to do whatever she wants and hangs up to finish preparing the stuff for their online fall collection. The next day Man Ok goes outside to exercise and jogs past fliers that cause her to stop dead in her tracks. She sees the picture of her and Tae Ik plastered on it with the words that Tae Ik has visited her dojo. Omo. This will not bring in the customers Man Ok would want. She walks the streets and finds the posters planted everywhere. She then finds Ga Ryung hanging up more. 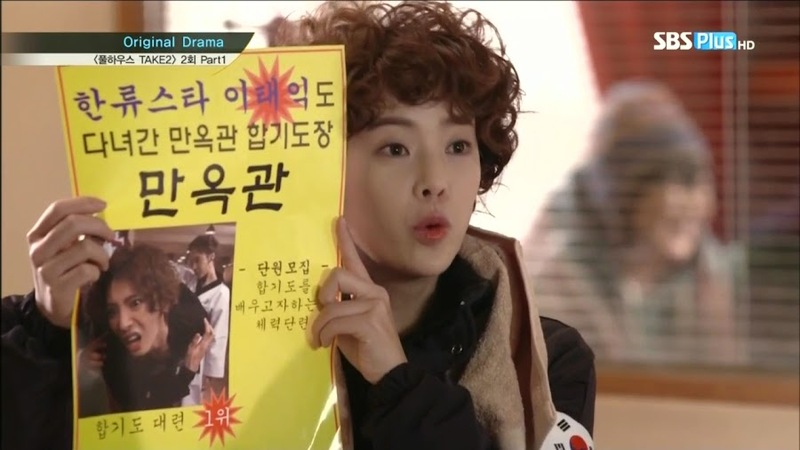 Man Ok changes her voice and states Ga Ryung can’t hang posters there. Ga Ryung immediately says she’s just a part-timer doing what her boss asked. Ah, this girl. Man Ok then demands who told her to do that. Man Ok goes to hit her and demands to know just what her friend thinks she’s doing. They go back to the dojo where Man Ok bawls her friend out for the cheapness of the posters and the crappy quality of the photo. Ga Ryung then scolds Man Ok for being a dummy and not spreading the word so the dojo could make even more money. Man Ok then says there is no way any one will come after seeing such posters. This is when mother’s bring in their children and ask if this is where Tae Ik had been. Ga Ryung happily says it is and the mother’s ask to register their kids. Ga Ryung reminds Man Ok it’s $5/head per new student and goes off to sign the people up. Man Ok stares in disbelief. She picks up the poster and more people come in. Man Ok then changes her attitude completely as more kids come in. Later, Man Ok happily goes to take a picture of the new, large class, but there is one girl without a uniform. Man Ok rushes off to get one and can’t find a spare. What happened? They used to have so many extras. She then comes across a uniform with girly little characters on it. So this has been here all along? Ga Ryung then calls Man Ok over to look at a picture. It’s of the little girl with the cutesy uniform that Man Ok loaned her for the group picture. It’s receiving so many positive comments online. Man Ok is happy to see that so many people loved the uniform she made. Ga Ryung then decides that they need to make and sell these cute uniforms. Man Ok says no one would want such a thing, but Ga Ryung says she has a nose for this stuff and these uniforms will be a big hit. At the boys’ house, Kang Hwi is all happy about something on his tablet while Tae Ik is going through receipts unhappily. Why is he $2 short? 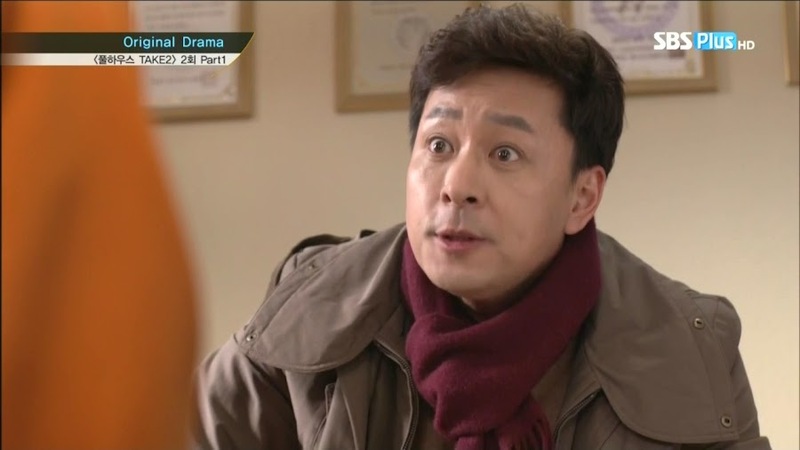 Kang Hiw happily pops into see Tae Ik who is not happy that Kang Hwi keeps coming and going at will. Kang Hwi says that Tae Ik should hire a bodyguard or something then. Kang Hwi then wonders why Tae Ik is adding receipts up in a an emergency like this. He picks one up and it’s for two hot bars (fish meat on a stick). Kang Hwi wonders why Tae Ik would have such receipts. 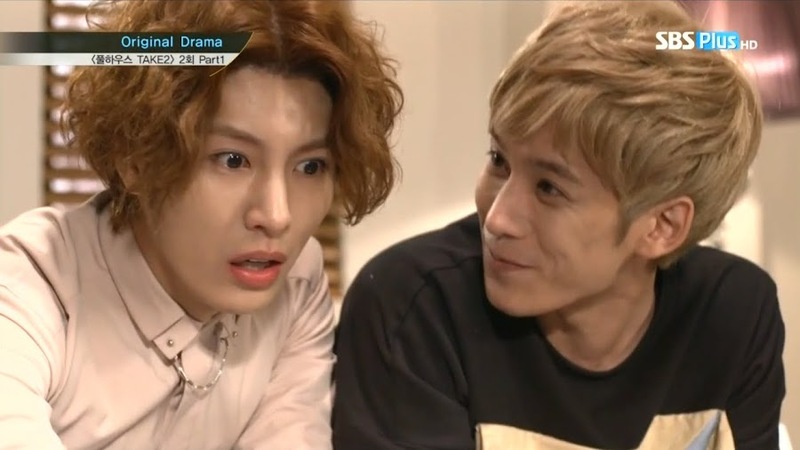 Tae Ik angrily snatches it back and Kang Hwi laughs at how poor his partner is. He then puts down the tablet where the little girl’s picture is sandwiched in between two coats. Tae Ik thinks its from his clothing ad, but Kang Hwi tells him to zoom in on one picture. Tae Ik zooms in on the girl’s picture and sees the poster on the wall. LOL. Kang Hwi laughs like a goofball and asks if that is really Tae Ik’s picture at Man Ok Dojo. Tae Ik immediately goes to the boss and demands that he site and picture get taken down at once. Joon tells him it’s not a big deal as no one will probably know its him. Tae Ik says that they have no idea how many of the posters exist. 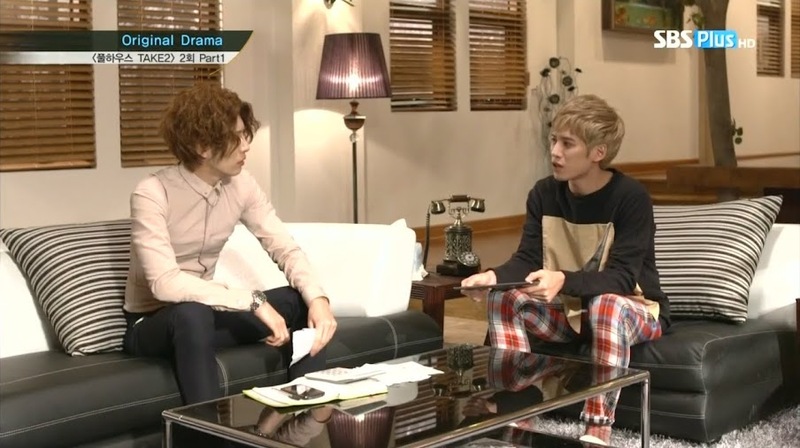 Again, Joon tells him to calm down as Bum Soo is on the case. This does not make Tae Ik feel any better. Joon says he may not like Bum Soo, but the older man has been in the business for over 30 years and will do anything for Take One. We then cut to Bum Soo tearing down all the posters as he makes his way to the dojo. These people aren’t afraid of anything, are they? I think that it’s technically illegal to use someone’s image for advertisement (especially a big star’s) without their written consent. Bum Soo sits down with Man Ok and puts the posters down. She immediately apologizes and says she was going to take them down immediately. Bum Soo then sees the one on the wall and Man Ok hurries and rips it off, adding it to the pile. Man Ok then says she didn’t do it on purpose, it just happened that way. Bum Soo doesn’t believe this because he thinks she personally had the posters made and then posted the picture with the poster in it on her homepage. Man Ok says she will quickly take everything off and down, but Bum Soo says the damage has already been done as pictures of the posters are popping up on personal blogs. He tells her that won’t be enough. Bum Soo then says that she will be sued for all the illegal things she’s done. This means shutting everything down and preparing the settlement money. Aigoo. That’s not good. Man Ok then gets a call from her grandfather. He complains about her unenthusiastic voice. Man Ok apologizes an hangs up on him and rushes out after Bum Soo only to see him pulling away. 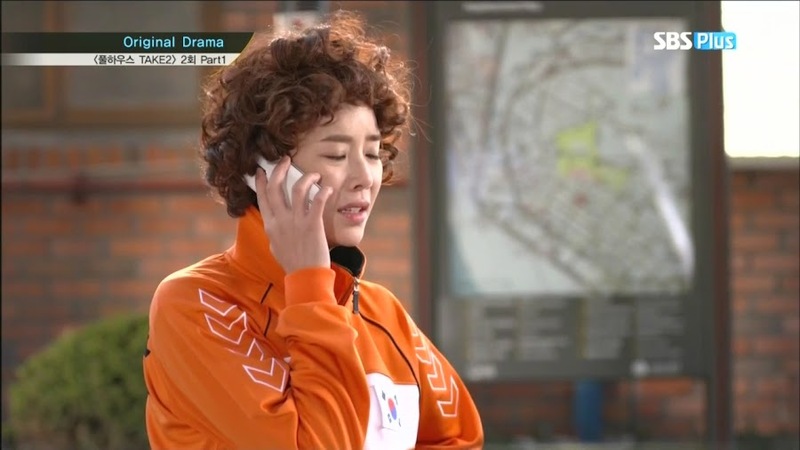 She then tries calling Ga Ryung, but the girl is not picking up. Enter her mother with dance instructor Mr. Oh. He has no place to train for his upcoming seminar, so Hong offered up Man Ok’s studio. Nice. Well…it does technically belong to Mrs. Hong. Man Ok replies that her grandfather would kill her if she let someone train in dance there. 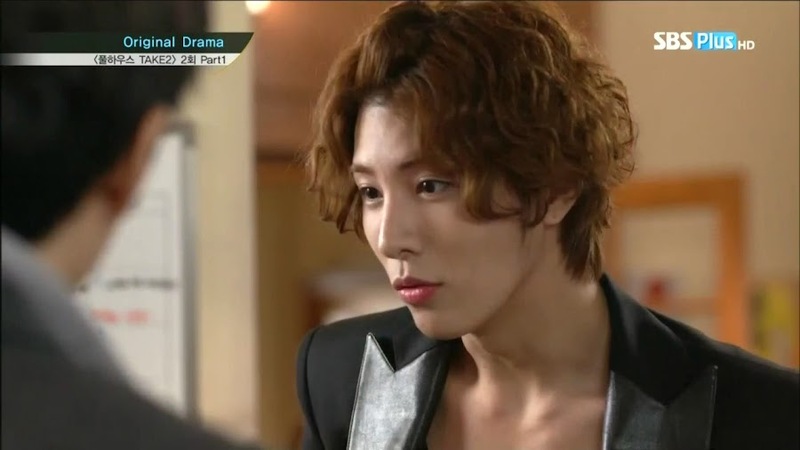 Mrs. Hong tells her not to be so inflexible as they will make sure nothing bad happens before Jang comes back. Oh even says he’ll pay $200 a night for rental of the dojo. This quickly changes Man Ok’s mind as she’s in need of lots of money right now. 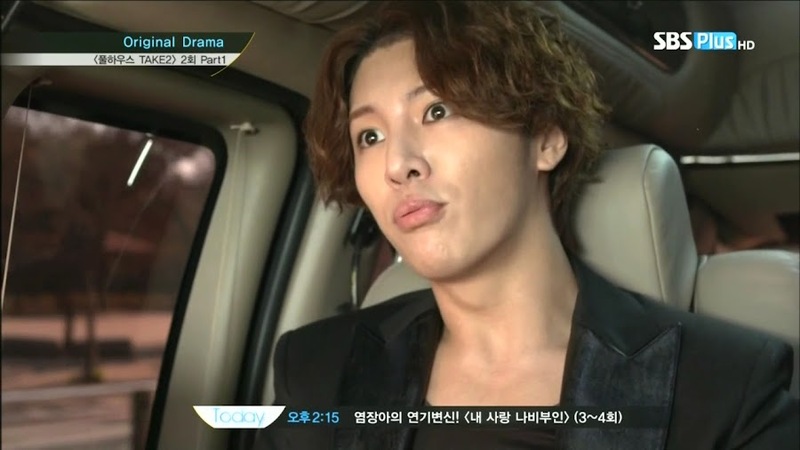 Man Ok tells her it’s okay and then says to make certain it’s kept a secret from Jang. Man Ok then gets a call from a law firm. Omo. That was fast. 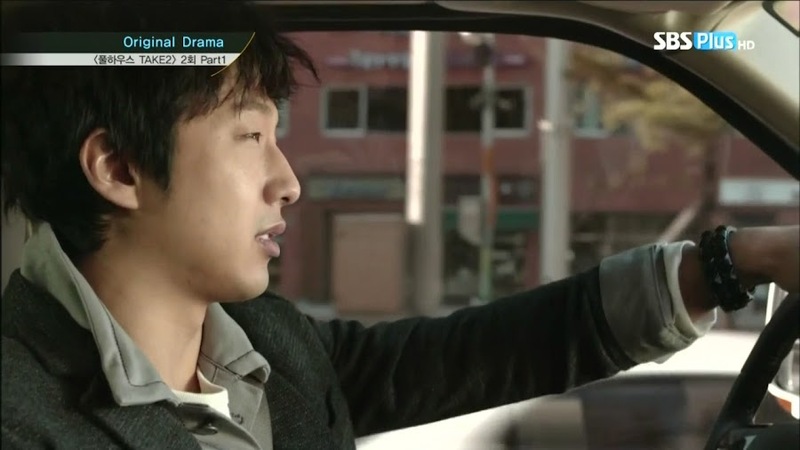 Meanwhile, Ga Ryung and her fan friends are all in a taxi chasing after Kang Hwi. Ga Ryung finally calls Man Ok back and Man Ok demands to know where Take One lives. This surprises Ga Ryung, however, she has no clue as no amount of investigating has ever uncovered where they really live. Man Ok can’t believe her friends’ stalker network couldn’t find their house. Man Ok then wonders how she can find out where Tae Ik is at the moment. 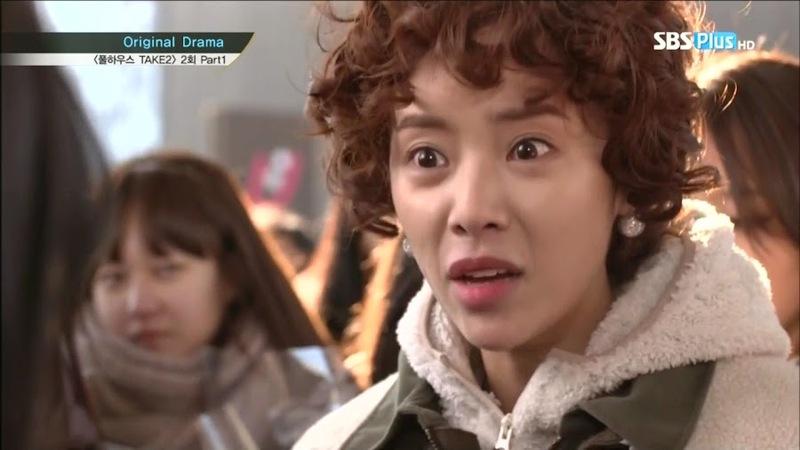 She then learns that Ga Ryung is chasing after Kang Hwi as Take One is on their way to some event someplace. Man Ok gets on her scooter wonder what to do. She asks if she pays compensation up front, then the charges will be dropped. The lawyer tells her its all dependent on whether or not the media finds out as it won’t do his clients any good. This is why they wish to settle. 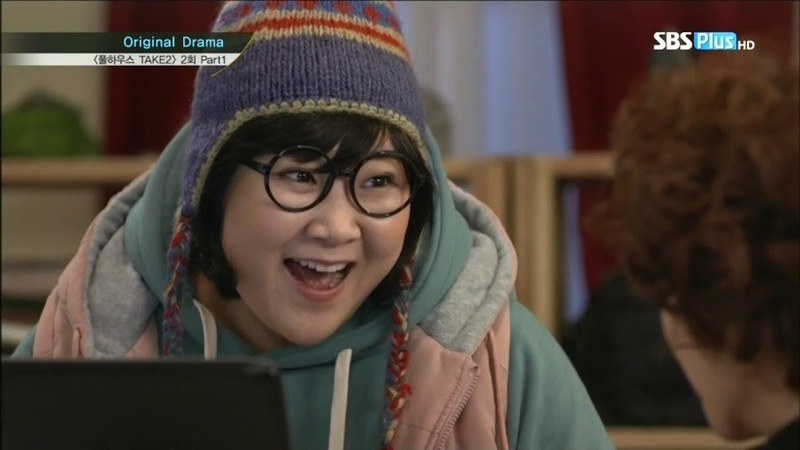 Man Ok is told that she has to immediately take down the homepage and prepare 30 million won. This sum of money is too large for Man Ok. She slouches at a red light and can hear her grandfather telling her to straighten out her posture. This gives her some strength. she won’t back down without a fight. That’s why she’s hunting Tae Ik down, to talk to him to see if they can’t come to some other arrangement. She arrives at where the boys are supposed to be and pushes through a gaggle of girls. The girls think she’s crazy for walking straight up to the door. She then is escorted out by security and toss her back into the crowd. The fan girls surround her and bawl her out for not knowing her place. Before a fight breaks out, the girls get a notice that Tae Ik has arrived and go running off. Man Ok chases after them so she can get to Tae Ik. She tries to break through the gaggle of girls to get to Tae Ik. He then comes up and the girls surge forward taking Man Ok with them. Man Ok tires unsuccessfully to get his attention and the van leaves and soon all the girls are gone as well. When Man Ok gets home the police has her dojo cordoned off. Man Ok runs up and demands to know what is going on. The police says there was illegal gambling going on. How could that be? Looks like Mr. Oh isn’t a dance instructor but the leader of an illegal gambling ring. 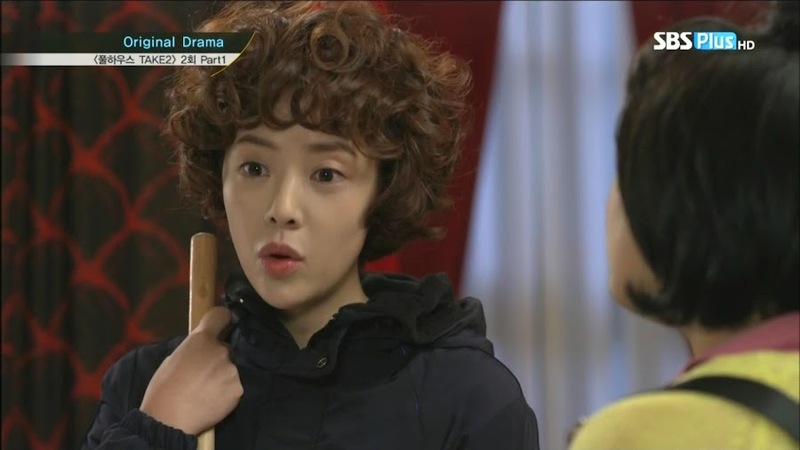 Jang Ok cannot believe this. How much worse can her day get? Much more as she is told that as the owner of the dojo she has to go with the to the station as well. You got to love dramas. They will put the characters through hell and take everything from them. Just when you think things can’t get any worse, they do. Poor Man Ok.